Guwahati high court’s decision to evict alleged illegal settlers of the 37 villages settled in the Amchang Wildlife Sanctuary (AWS) came after hearing a Public Interest Litigation (PIL) filed by an NGO named Early Birds in August. Over 700 families have been rendered homeless in the three-day eviction process. The Indian police took an unusual step, reportedly, 1,500 policemen carried out the eviction on November 27, 28 and 29 using elephants along with 300 labourers and bulldozers, in order to tackle the stone pelting protesting locals, who saw their homes being destroyed helplessly along with other establishments such as schools and places of worship. “This is a hard thing to take a stand on. On one hand, flora and fauna have limited land resources and they need protection. On the other, people need more land as their population grows and expands. It’s sad on both sides,” Said Shreya Podder, ecological and sustainable development sciences student at TISS, Guwahati. 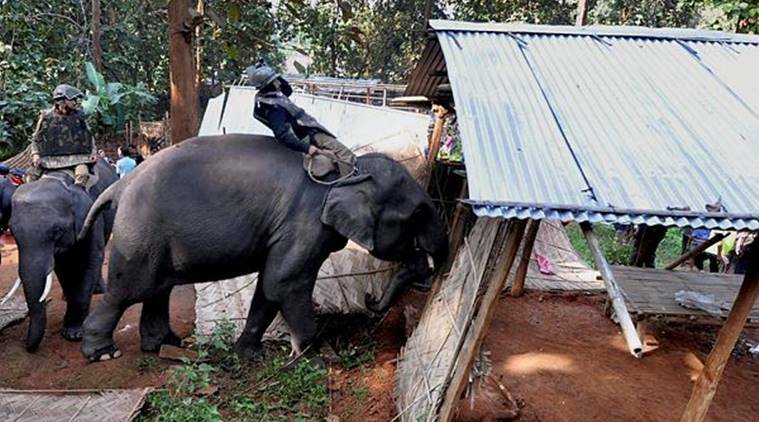 A similar case happened in 2016, two people were reportedly killed and 17 injured, including 15 police officers, when protesters clashed with authorities during an elephant-led demolition drive in Kaziranga national park. Amchang was declared a wildlife sanctuary by the state government in 2004, bringing together three forests; Amchang reserve forest, South Amchang forest reserve and Khanapara reserve forest.